Who doesn’t love potatoes? Mashed, baked, scalloped, or as French fries – potatoes are one of the most popular foods in the U.S. You’re probably familiar with Russet potatoes – the big brown ones used for baking – but did you know that there are hundreds of varieties of potatoes? 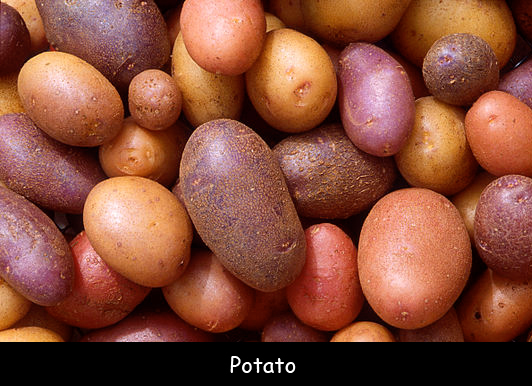 Potatoes come in many colors, including brown, white, red, yellow, blue, and purple. Potatoes are the fourth largest food crop in the world after rice, wheat, and corn. The Inca Indians first cultivated potatoes in Peru 5,000 to 8,000 years ago. Spanish explorers conquered Peru in 1536 and took potatoes back to Europe. Basque farmers in Spain were the first to grow them in Europe. Sir Walter Raleigh introduced potatoes to Ireland in 1589. Potatoes became one of Irelands staple food crops. Potatoes were thought to be more nutritious and easier to grow than grain crops. In the 1840s, a potato blight swept through potato farms across Europe and Ireland. Over 1 million people in Ireland died from starvation or disease. Another 1 million left Ireland for Canada and America. Colonists in Jamestown were the first Europeans to grow potatoes in America. Missionaries introduced potatoes to Native Americans living in Idaho. Today, Idaho grows more potatoes than any other state. King Louis XIV created a feast of nothing but potatoes, popularizing the vegetable in France. Benjamin Franklin attended the feast. Answer: Potatoes are high in vitamin C. They also contain potassium, protein, and vitamin B. The Incas used potatoes for medicinal purposes, such as healing broken bones. To learn more, visit Potato Goodness. What does Thomas Jefferson have to do with french fries? Visit this website to find out. Visit the Smithsonian to find out more about the history of potatoes.